Students examine how they face everyday moral dilemmas and consider who and what influences their reactions when conflicts arise. Incorporate vocabulary that identifies the different roles people play in conflicts. Use adjectives to describe specific behaviors. Articulate their own points of view in difficult situations or dilemmas. Understand what motivates people to take on different roles in conflicts. What are upstanders, bystanders and whistle-blowers? How does adding an adjective describing the behavior of an upstander, bystander or whistle-blower express a more authentic, accurate situation? How do you decide where you stand in a difficult situation? What factors help people decide how to act or what to do when faced with a conflict? This is the first lesson of the series “Dealing with Dilemmas: Upstanders, Bystanders and Whistle-Blowers,” which invites students to examine how they would respond to everyday dilemmas that test their character and value system. By working through three or four scenarios, students will figure out where they stand, literally and figuratively, when conflicts arise. What would they do? What choices would they make? They will also have the opportunity to think about how and why the actions of their classmates influence their choices. Of the many positive character traits addressed in a character education curriculum, courage is the foundation for helping students stand up for what is right, become leaders and achieve their goals. Creating, role-playing, analyzing and reflecting on scenarios that require courage can help students develop skills to resist negative peer pressure, speak out against injustice and make choices based on core values. bystander [ bahy-stan-der ] (noun) A person present but not involved; chance spectator; onlooker. courage [ kur-ij, kuhr-ij ] (noun) The quality of mind or spirit that enables a person to face difficulty, danger or pain without fear; bravery. dilemma [ dih-lem-uh ] (noun) A situation requiring a choice between equally undesirable alternatives; any difficult or perplexing situation or problem. upstander [ up-stan-der ] (noun) One who speaks up and becomes involved. whistle-blower [ hwis-uhl bloh-er, wis- ] (noun) A person who informs on another or makes public disclosure of a wrongdoing. Explain to students that they will be taking part in an exercise in which they will explore similarities and differences in opinion. Give students a series of scenarios (the graphic organizers for grades 3-5 or grades 6-8). Ask them to fill out each sheet on their own, agreeing or disagreeing with the protagonist’s action in each scenario and stating the basis for their opinion. The completed forms will come into play later in a larger group setting, but for now, allow students to process their own thoughts as they complete the sheets. While the students are filling out the graphic organizers, place the “Agree” and “Disagree” signs on opposite sides of the room, leaving plenty of space between them for the “Not Sure” area. Be sure to have an area available where the scenarios can be written out or projected for all to see. Explain to students that they will now discuss the scenarios as a group. They will begin by reading the scenario on the board and refreshing their memory, if they need to, by looking back at what they wrote on their own sheet. If they strongly agree with the statement, they will move to the “Agree” side of the room. If they strongly disagree, they will move to the opposite side where the “Disagree” sign is posted. If they are unsure of their feelings on the issue, they will stand at the midpoint where the “Not Sure” sign is placed. I prefer pancakes to waffles. Broccoli is the best-tasting vegetable. 5. Now, one by one, present three or four grade-appropriate scenarios from the Scenario List (grades 3-5 or grades 6-8). Once the students have chosen their sides, allow them two minutes to share with those they are standing with why they chose the side they did. Then, ask individual students to share with the entire group why they decided to stand where they are, either by reading aloud from their forms or by describing the basis of their opinion. Ask students to use “I” statements in responding to why they chose their location. You might want to limit the responses to one minute or choose just one person in each of the three areas to respond to each question. Chart key words that students use for the post-activity discussion. 6. As students listen to their classmates explain why they moved to the “Agree,” “Not Sure” or “Disagree” areas, let them know that they are free to change positions if they hear something that alters their original viewpoints. Your role in this portion of the activity is to keep everyone involved, ensure that students articulate thoughtful reasons for their selected positions, and not allow the discussion to become too personal or raucous. Once the students get the hang of this exercise, they should engage in a fluid, lively and respectful dialogue with your guidance. 7. After all three or four scenarios have been discussed, bring the group back together. Write the words upstander, bystander and whistle-blower on the board. Ask the students what these words mean to them, if anything. Chart key words from three to five responses. Provide the proper definition for each word from the glossary. 8. Next, ask students think of adjectives that can be added to the words upstander, bystander and whistle-blower that will give a richer understanding of a person’s traits, motivations, and feelings and not just to describe their actions. For example: scared bystanders, curious helpers or nervous whistleblowers. 9. Using the newly defined descriptors, close the lesson by asking the students to label or identify the protagonist in each of the scenarios they engaged with earlier. For more scenarios, see Courage Scenarios to Use in the Classroom. In small groups of four, role-play one or two of the scenarios, ending with a positive outcome. Have students create their own scenarios, positioning the protagonist in the role of upstander, bystander or whistle-blower. Ask students the critical question of what they would do if they were presented with this dilemma. Present English language learners with photographs or videos (played on mute) depicting iconic scenes from history or the news. 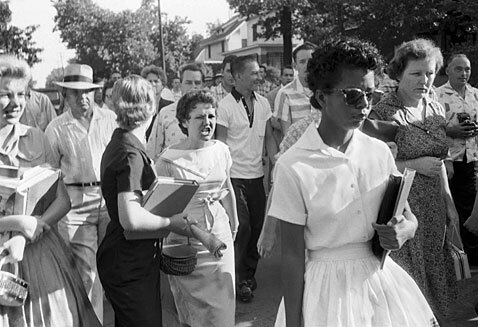 Some examples include The Power of One, Little Rock Nine Segregation and Beneath a Burning Car. Record the students as they describe what they see. Write down the adjectives that they use to describe the scenery and the facial expressions and actions of people in the pictures.